Conservatories bring extra room and light into any home, opening up your existing property with a space that can be customised for a variety of uses. Whether you're looking for a relaxing space to sit and look out into the garden, a room to host a dining table or even a place indoors where you can grow flowers or vegetables, a conservatory offers the perfect solution. When the time comes to sell your home, a high-quality conservatory can also be a major attraction for buyers, which means they have the potential to add value to your property. Not only that, a stylish conservatory is a pleasure to be in – all in all, they’re an investment you're sure to love. At Anglian Home Improvements, our skilled British craftspeople are on hand to create the conservatory of your dreams. Each conservatory is individually designed – we'll work closely with you on every single detail, covering the conservatory material, roof design and overall style. We’ll even fill out the planning permission paperwork if your home requires it. Browse our full range today, and remember our design experts are always available if you need any assistance. Conservatory, orangery or extension: what's the difference? We break down the difference between conservatories, orangeries and extensions to help you decide which living space is best for you. Will a conservatory add value to your home? It's the question on everyone's mind - conservatories add extra space to your home, but can they also add value? We're here with expert advice. Securing planning permission for your conservatory is easier than you think. Anglian will help you every step of the way – we'll even submit the paperwork! It's the question on everybody's minds – just how much is a conservatory going to cost? In this guide, we break down what can affect the cost and how Anglian make it more affordable. How easy is it to keep a conservatory warm or cool? Conservatories are added living spaces, so do they need additional heating or cooling systems? We'll break down all the basics for you and provide some tips on how to keep your conservatory warm or cool throughout the year. How long does a conservatory last? As conservatories are a major investment, you'll want to make sure you're getting the most for your money. We'll give you some hints and tips on how to maintain your conservatory and make it look newer for longer. With so many suppliers out there, it can be tricky knowing where to turn. We'll give you a few pointers on how to separate the cowboys from the real deal. 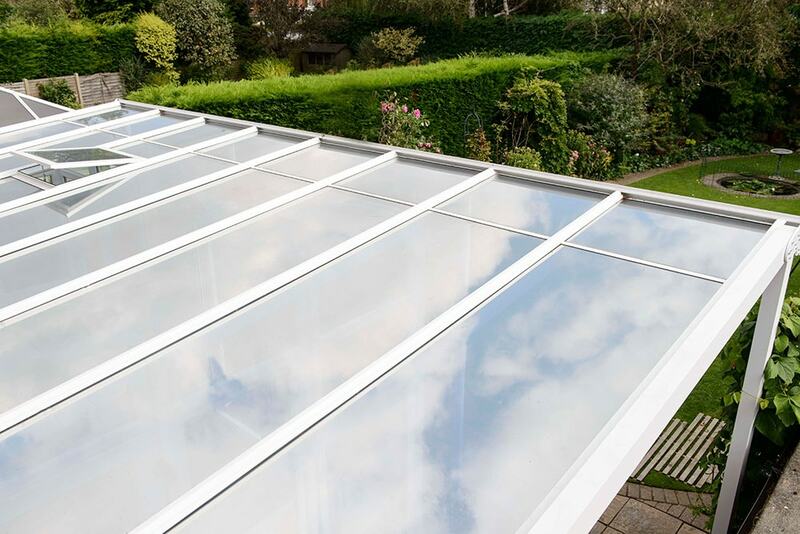 Whether you're replacing your existing conservatory roof or starting from scratch, we've got you covered with our range of thermally-efficient conservatory roofing options. Wood or uPVC: which is better for your conservatory? Here, we'll go over all the pros and cons of our top two conservatory materials to help you decide which one is best for you. Big, small or awkwardly-shaped spaces are no match for an Anglian conservatory. Here, we'll show you how to fit a conservatory into any space, no matter the constraints. Getting the right shape to your conservatory so that it matches your home is more important than you think - it'll make it more usable and can help add value to your home. Anglian's Solaroof system not only helps reduce the sun's rays and glare coming in through your conservatory roof, but can mediate heat, too. Read here for more information on our unique roofing technology. You've seen the advertisements – but should you buy a secondhand conservatory? We'll break down all you need to know and why it's worth investing in a brand new living space. You heard us right – we'll complete your planning permission paperwork for you, so your conservatory build is stress-free. If you can find another company that beats our price within seven days of signing a deal with us, we’ll match it – simple as that. Our list of guarantees will give you peace of mind that you're getting the best possible product and service available. Read here for our complete list. Our more than 50 years of experience improving Britain's homes is just one of the reasons you know you're getting quality with Anglian - we've also got the accolades to prove it. Adding finishing touches to your conservatory is the best part! Here, we give you tips on the best flooring, lights and even plants to add to your new living space. By choosing Anglian, you're choosing high-quality, tailor-made windows from a company you can trust. Read more about the Benefits of Anglian Glazed Windows. We've been trading for over 50 years and go out of our way to make replacing your windows an easy and pleasurable experience, from planning to payment. We always offer great quality products backed by strong guarantees.